My Mom gave me a starter mix of the Amish Friendship bread about a year ago and I made it every day for months. Then I got sick of it. Now I want it again but of course I have no mix left! 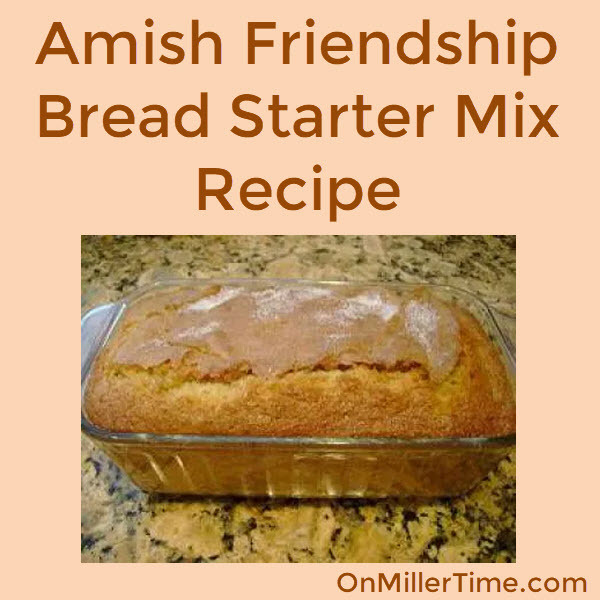 Here’s my family recipe for Amish Friendship Bread Starter Mix Recipe. I thought I would share it so everyone could have bread. The best part about this recipe is that you end up with starter mixes to share with friends and family. Enjoy – this stuff is AWESOME! 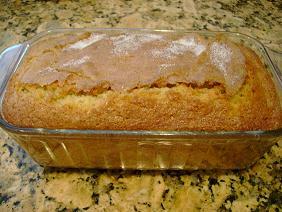 For the Friendship Bread: – this is exactly the recipe I received with mine! Dissolve yeast in warm water. Stir together (using a non-metallic spoon) 1 cup sugar, 1 cup flour and 1 cup milk in a non-metallic bowl or container. Add yeast mixture and stir. Day 1: Do nothing; it has been stirred. Days 2, 3 and 4: Stir. Day 5: Add 1 cup milk, 1 cup sugar, 1 cup flour. Days 6, 7, 8 and 9: Stir. Day 10: Add 1 cup milk, 1 cup sugar, 1 cup flour and stir. Remove 1 cup to make your first bread, give three cups to friends along with the recipe. Store the remaining starter in a container in the refrigerator and begin the 10 day process over again. You can also freeze this starter in 1 cup measures for later use. Frozen starter will take at least 3 hours at room temperature to thaw before using. Whisk together in a medium bowl the flour, pudding mix, baking powder, cinnamon, salt and baking soda; set aside. In large mixing bowl combine remaining ingredients, mixing well. Stir in the flour mixture, mixing only until just combined; do not over mix. Pour into two 9 x 5 x 3-inch loaf pans. Bake at 350*F (175*C) for 50 to 60 minutes. For variations, add your favorite dried fruits, nuts and/ or chocolate chips. The recipe above calls for stirring but I received mine in a ziploc bag so I only had to mush the bag everyday. The boy had fun with that! Make sure to put the date you made it on the bag so you can keep up with where you are in the recipe. Makes 2 loaves.